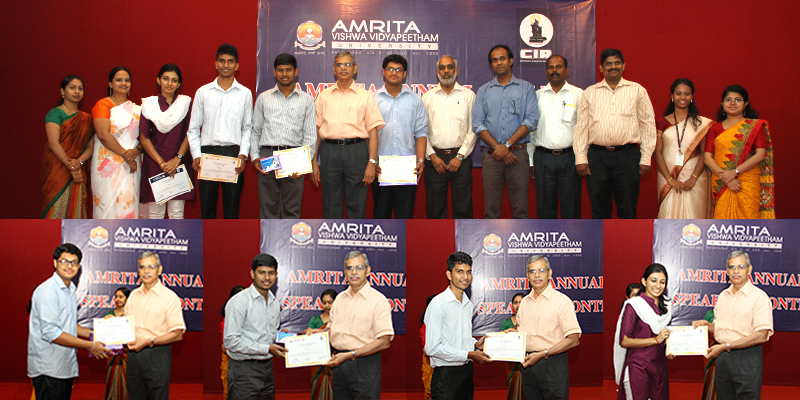 The final round for Amrita Annual Public Speaking Contest for the year 2014 organized by Corporate and Industry Relations (CIR) was held on 23rd of April, 2014 at Amriteswari Hall, Amrita Vishwa Vidyapeetham, Coimbatore. The seventeen finalists were shortlisted after two rounds of public speaking in which more than a thousand third year B Tech students participated. The final contest was judged by three distinguished judges. The first judge was Dr.Harini Jayaram, Head of the Department of English, Amrita Vishwa Vidyapeetham. The second judge was Dr.Madhu Menon, Chief Manager, CIR and the third judge was Mr.Prabhu Amarnath, Manager, CIR. The final round saw the contestants competing in a sporting spirit. The audiences were thrilled to listen to a few energetic and enlightening speeches on various topics. The name of the winners were declared by Mr.C Parameswaran, Director, CIR. The first prize was won by Athul of third year B tech, EIE. The second prize was bagged by N. Naresh Perumal of EC department, III B Tech and the third prize was shared between two contestants: Nayak Prateik Ramesh of Mechanical department, III B tech and Kavya Menon of EC department, III B Tech. The winners were given prizes and certificates by the Director. All the finalists too received certificates for participation. The vote of thanks was delivered by Ms.Sneha Nair, Faculty- Verbal Skills.